Cape Canaveral, Florida and Hawthorne, CA – After making the historic journey as the first commercial spacecraft to visit the International Space Station, SpaceX’s Dragon spacecraft will return to Earth today. SpaceX spokesperson Kirstin Brost Grantham said in an email that "the return is by no means an easy operation. 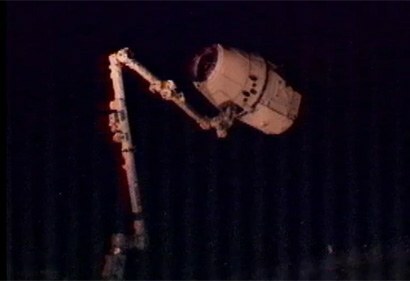 In fact, today, Dragon is the only spacecraft capable of returning a significant amount of cargo from the space station. The other cargo vehicles serving the space station – from Russia, Japan and the European Space Agency – can carry cargo up but all are destroyed after leaving the station." Yesterday morning, astronauts closed the hatch on the vehicle. The SpaceX Dragon capsule was released from the International Space Station’s robotic arm by crew members of Expedition 31 at 5:49 a.m. EDT this morning. The capsule now will begin a series of departure burns and maneuvers to move beyond the 656-foot (200-meter) “keep out sphere” around the station and begin its return trip to Earth. The capsule is currently scheduled to splashdown in the Pacific Ocean at 11:44 a.m., hundreds of miles west of Baja California. 11:35 AM EDT UPDATE: Dragon's parachutes deployed. 11:42 AM EDT UPDATE: Dragon has splashed down.